Pixar as a formidable storytelling machine is not an entity I'm entirely comfortable with. The studio has turned itself into a faceless animation brand name, and while I can't argue the box office numbers, I'm not buying the artistic results. 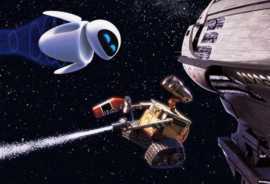 Wall-E is Pixar's biggest creative gamble in over a decade; a genuine cinematic leap of faith. However, the ambition doesn't match the outcome, and while Wall-E dances whimsically, it's a plodding, frighteningly hypocritical, and forbidding film that trips over its fogged intentions at every dreary turn. It's 800 years into the future, and Earth is left in a pile of ruins, with garbage piled as high as skyscrapers and the landscape a sickly shade of brown. The last robot left on the planet is Wall-E, a compactor machine who dutifully carries out his business cleaning up the land while he dreams of companionship, fueled by repetitive screenings of "Hello Dolly" and indulging his childlike curiosity whenever he can. Sent to Earth to retrieve signs of life is Eve, a probe droid who Wall-E is instantly smitten with, and the two form a startling bond. When Eve finds a plant sample on the dead planet, she's snatched back to the pathetic remnants of the human race for questioning, leaving Wall-E ready to hitch a ride off Earth to remain with her. It's easy to become wrapped up in the light show director Andrew Stanton (Finding Nemo) fires off with Wall-E. It's a film seemingly constructed with a mind toward pure simplicity: our hero, Wall-E, is a robot who only speaks in electronic tones, participates in plenty of slapstick inquisitiveness, and all he wants is love. 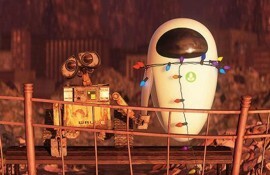 It's a veritable Pixar to-do list of elementary visual gags, and Wall-E indulges every scrap of physical comedy available for the first third of the picture (nearly completely free of dialogue), even handing the robot a traditional best pal of sorts in a loyal cockroach. This is the comfortable, reassuring padding that Pixar could accomplish with their eyes closed, with Wall-E decked out in full cute mode to help ease the audience into this bleak, post-apocalyptic world that few G-rated animated projects would dare consider. "It's pretty ballsy to condemn corporate insatiability while indulging in it to market your film!" Where Wall-E heads next is sure to divide audiences. Following Eve into space, Wall-E boards the "Axiom," a huge cruise space ship that's home to the loose ends of the human race. You see, in the 700-years since mankind bolted from Earth, they've evolved into overweight blobs of pudding, nurtured by the Buy-N-Large Corporation who use humans to feed the endless, aggressive cycles of profitable consumption, leaving them helpless and totally enslaved to commercial trends. The human characters are obese nincompoops who've lost the ability to walk eons ago, puttering around on floating chairs waiting impatiently for their next needless desire to be force fed to them by the all-powerful corporate machine. Here's where I remind everyone this is a Pixar/Disney picture. Pixar/Disney. Decrying greed. It's a pretty ballsy move to create a film condemning the culture of gluttony and corporate insatiability while indulging in those practices to market a film (kids, make sure to buy a Wall-E toy on the way out! ), and it opens a can of worms that Stanton has no idea how to properly sort to dramatic satisfaction. Wall-E paints in massive brush strokes, attempting to educate younger audience members with horrific vistas of a polluted, wasted Earth and the overall piggish behavior of the humans, while also making sure Wall-E is endearing enough to use on games, toys, and stuffed animals so all concerned make a mint off of vulnerable family audiences. If Wall-E was a scrappy independent film emerging from, say, the great Ralph Bakshi, the contrast and violent condemnation would've been a total gas. Coming from Pixar/Disney, it feels… discourteous, or, at the very least, corrosive and incompetent. The overall finger of intolerance is wagged with gale force winds here; a fascinating momentum lost on a picture easily 30 minutes overlong. Wall-E doesn't have much adventure on its mind, nesting comfortably in the details of cutesy robot behavior and mad lunges toward audience sympathy, but there's no dramatic spine keeping the film a riveting sit. Still, Stanton pushes forward, drawing out Wall-E's lust past the expiration date and into full-out repetition. I'm the first guy to applaud a Pixar film not entirely swathed in cliché, but the spark of the film is in constant threat of being snuffed out by the habitual elongation of the ice-thin story. I wasn't moved by Wall-E's Chaplinesque mishaps and intergalactic dreams, just agitated that Stanton doesn't take the character past infantilization or offer something more than pratfalls for our hero to undertake. Wall-E's shtick tires quickly. To some, Wall-E is an adorable character with rich emotional professions, and that's all the cinematic nutrition they need from this picture. I craved that sensation while watching Wall-E, but it never arrived. Instead I was left bored and insulted by a misguided, preachy film riddled with absurd messages and run into the ground by complete storytelling lethargy. But that Wall-E sure is cute, huh? Read our DVD review (Three-Disc Special Edition + Digital Copy).